DALLAS—Dr. 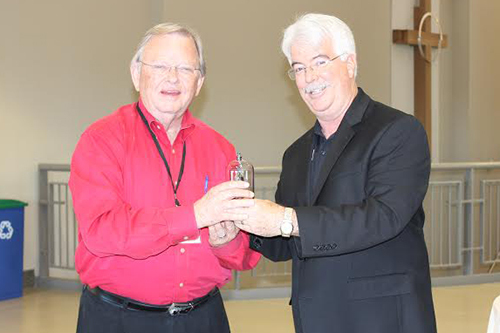 Jimmy McLeod, Intentional Interim Ministry pastor of Park Central Baptist Church in Dallas, was presented the 2015 Maples, Williamson, Daehnert (MWD) Award by the Texas Baptists' Intentional Interim Ministry (IIM) Network for his faithful work to the ministry. On Oct. 13, McLeod became the seventh recipient of the MWD Award, which is given annually to pastors who have completed the IIM training and have shown exemplary leadership, vision and mentoring in their churches and with ministers. "Dr. McLeod has demonstrated his unique gifts in encouragement, unifying congregations and mentoring leaders," said Karl Fickling, interim ministry coordinator for Texas Baptists. The IIM Network consists of pastors who have fulfilled over 80 hours of formal training in the intentional and traditional interim process and become members after five months of field education. McLeod's interest in Intentional Interim Ministry dates back to 2005, when he was trying to discern what God had planned in his next season of life, after he had been serving in ministry in various capacities for over 40 years. Through a friend, he was introduced to Intentional Interim Ministry, and immediately grasped on to the vision behind it. In 2010, after completing training requirements, he began serving as an Intentional Interim Ministry pastor at Emmanuel Baptist Church in Weatherford, where he was reassured this type of ministry fell right in line with his gifts. "It is my heart's passion," said McLeod, who also serves as a Board Certified Pastoral Counselor. "I saw a way that in this new season of my life I could help people and churches heal and learn how to deal with things more healthily and really become a healthier part of the body of Christ." From examining a church's history to looking into the church's future, IIM pastors are trained to guide churches through a self-study in order to identify problematic issues before even beginning to search for a new full-time pastor. "The real significance in Intentional Interim Ministry is that it allows the church to slow down, to pause, to reassess where they are and then to get the help they need from a trained pastor," McLeod said. He further explained that an IIM pastor comes as a non-anxious presence into an anxious situation and helps churches identify and address issues. Then, the IIM pastor can help the church get a fresh vision for the future. "[Intentional Interim Ministry] gives an opportunity to give the church an identity of who they are and who God's called them to be," McLeod said. "Then they can take a look at the blockages. When the next pastor comes, he doesn't have to deal with all that. The church can embrace him and he can then enjoy that new vision God gave them." There are around 110 ministers in the IIM Network. Whether a church desires to have an intentional or traditional interim pastor, the interim church services staff with Texas Baptists is eager to help churches that have lost a pastor find the right person to fill the pulpit. For more information about interim ministry, visit texasbaptists.org/interim or contact Karl Fickling at karl.fickling [at] texasbaptists.org.